The Indian Markets will open after a period of slumber because of a long weekend. The session on Wednesday, which was the last trading day of the previous week as well as the expiry day saw the Markets ending of a weaker note with NIFTY losing 70.45 points or 0.69%. The Global Markets were shut only on Friday on account of Good Friday. On Thursday, they have ended on much stronger note. In all likelihood, our domestic Markets are likely to see a strong opening and the NIFTY may open above the 200-DMA level of 10180. As always been the case, it would be critical to see if the Markets are able to capitalize on the likely stronger opening that it is set to get on Monday. Sustenance and closing above the 200-DMA will be key technical point to watch for. The levels of 10180 and 10225 will act as immediate resistance levels for the Markets. Supports come in at 10075 and 10040 zones. The Relative Strength Index – RSI on the Daily Chart is 40.7668 and it stays neutral showing no divergence against the price. The Daily MACD is bearish while trading below its signal line. However, it is moving towards reporting a positive crossover. No significant formations were seen on Candles. 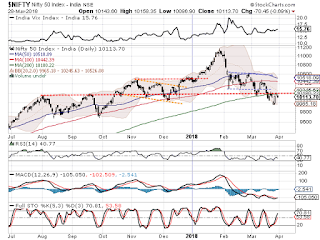 Looking at pattern analysis, it is observed that the levels of 10180 which is the 200-DMA for the Markets also happens to be one of the important pattern resistance for the Markets as well as evident from the Chart. This level, once breached on the upside is likely to act as support going ahead. Overall, there are high probabilities of the NIFTY enjoying a strong opening on Monday. However, moving past and sustaining above the 200-DMA will be crucial. 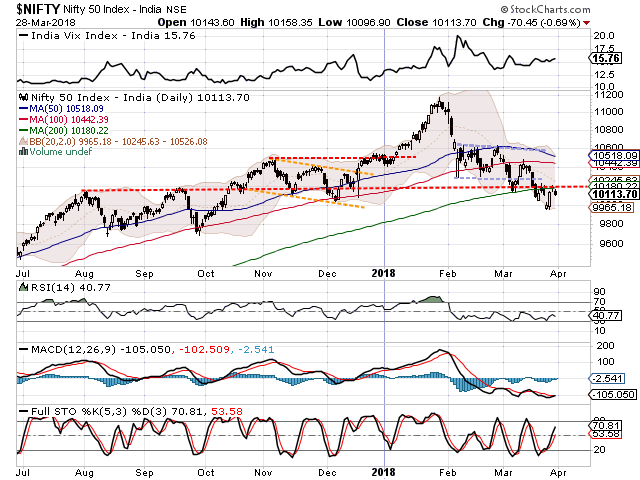 If the NIFTY moves past and sustains above the 10180-mark, it would be a significant technical development and NIFTY, in that case, will mark a temporary bottom for itself for the immediate short term. Positive outlook is advised for the day.